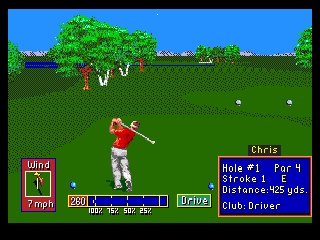 Anyone who has played the original PGA Tour Golf on the Genesis will instantly feel at home with the sequel. This game still uses the same drop-down menu system and the exact same gameplay interface, and all of the options and game modes available in the original release have carried over. The graphics however have definitely improved for this release. Both the players and the environments appear more detailed thanks to an increase in the number of colors being displayed on the screen at any one time. Additionally, many of the colors used in the gameplay windows have been changed to make them more pleasing to the eye. The game features a whopping 7 courses; all 4 courses from the original PGA Tour Golf game, plus TPC at Southwind, TPC at Eagle Trace, and TPC at Scottsdale. As this game includes all of the content from PGA Tour Golf, there’s no reason to own that game if you can get this one. Polygames and EA did an excellent job of improving upon a great game without messing with a winning formula, and the result is a game that looks better, contains almost twice as much content, and doesn’t take a single step backwards. Buy PGA Tour Golf II on GameGavel or Amazon. Tagged genesis, Golf, PGA Tour Golf II, Review, sega, Sports. Bookmark the permalink.